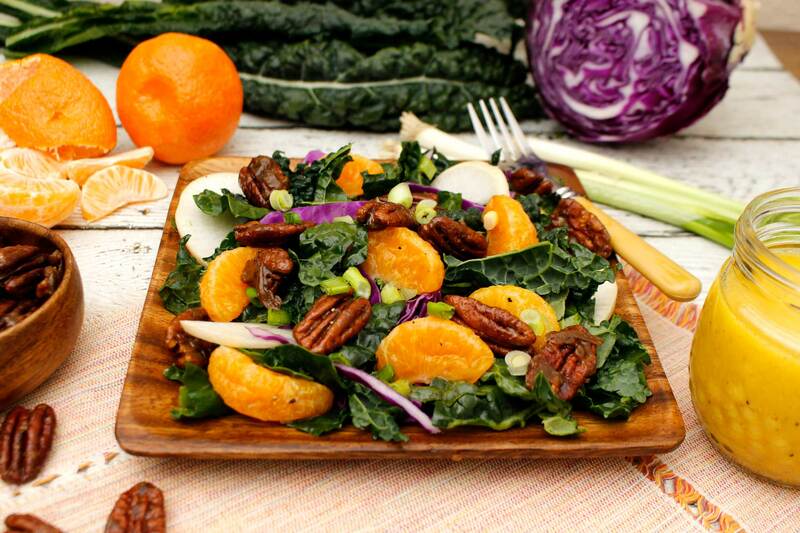 This salad is not only beautiful, it is also tasty and satisfying with sweet mandarin orange segments, healthy kale, crisp turnips and candied pecans. Preheat oven to 375 degrees F. Line a large baking sheet with tin foil or parchment paper and set aside. In a small bowl mix the pecans with the brown sugar, melted butter and salt until well coated. Pour pecans onto the prepared baking sheet and roast in the oven until golden brown and sugar is bubbling, about 4 minutes. Turn pecans over and roast for 2 more minutes. Be careful not to burn the nuts or sugar. Remove from oven and let cool completely. Meanwhile, whisk all of vinaigrette ingredients together until they are well combined, about 2 minutes. Chill until ready to use. In a large bowl mix the kale, cabbage or radicchio, turnip slices, mandarins and half of the green onions. Drizzle in a little vinaigrette and gently toss to coat. Plate the salad onto salad plates, drizzle with more vinaigrette and top with the candied pecans, the rest of the green onions and freshly cracked pepper.